The DPK scripts are simply amazing. I enjoy the flexibility of the new DPK system. I will confess, creating an HCM demo environment with DPK is not as easy as the prior PUM image method, but it is pretty close. As I prepared for OpenWorld 2016, I thought I would download the latest HCM DPK (update 18) and build out a new demo server on my MacBook. Unfortunately, I wasn't able to use the standard Windows PowerShell approach (PowerShell on Mac? Yes, maybe...) so went with the manual VirtualBox import method described in the document: PeopleSoft_Deployment_Packages_For_Update_Images_Installation_July2016, page 31 Task 2-2-2. Everything was running great until the VM attempted to extract HCM-920-UPD-018-OVA_12of15. The install process seemed to hang. With a little investigation, I found that the VM's second disk was full. The solution was rather simple: expand the disk and try again. Just in case you find yourself in this situation, here are the steps I performed to expand the virtual disk. Next, I cloned the second disk using the command VBoxManage clonehd VBOX_8_55_06_SHELL-disk2.vmdk VBOX_8_55_06_SHELL-disk2.vdi --format vdi. 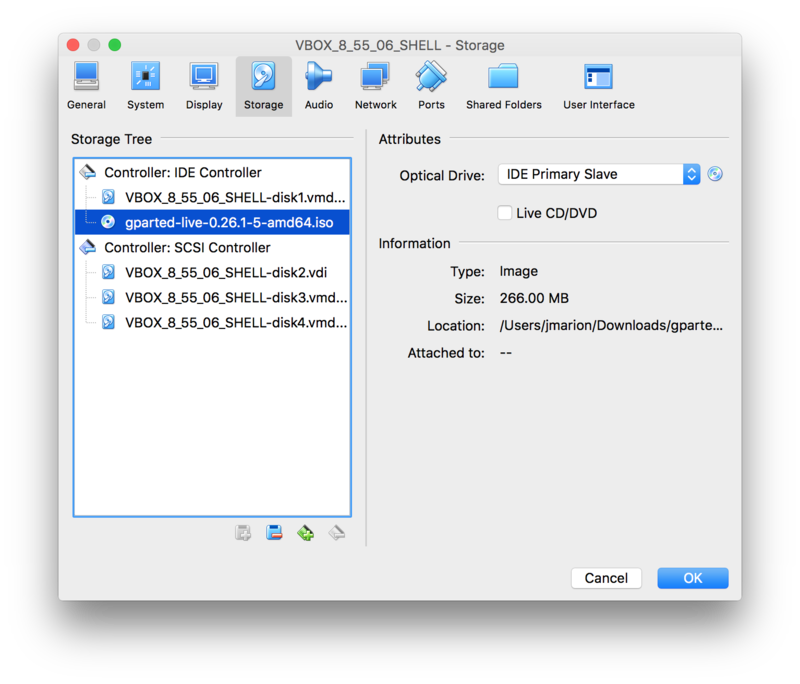 The point of cloning into a VDI is so we can use VirtualBox commands to expand the disk. I then expanded that new disk using the command VBoxManage modifyhd VBOX_8_55_06_SHELL-disk2.vdi --resize 122880. I didn't need to make the disk 120 GB. VirtualBox tells me the image is only using 65 GB, but it doesn't hurt to have extra capacity. The disk files grow as needed. Optional step: If you want, you can convert the disk back to a VMDK, but this is not necessary. I kept the VirtualBox VDI. VBoxManage clonehd VBOX_8_55_06_SHELL-disk2.vdi VBOX_8_55_06_SHELL-disk2.vmdk --format vmdk. You need to tell VirtualBox to use the new disk you just created. 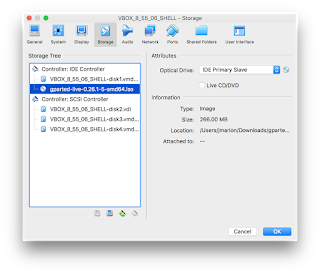 Open the Virtual Machine's settings and switch to the storage section. Replace the exising *disk2 entry with the name of the file you just created. With the ISO downloaded, open the guest's properties and switch to the storage settings. Add an optical drive to the IDE controller and select the ISO you downloaded. Apply your changes, shutdown the virtual machine, and then remove the GParted disk ISO from the virtual drive. Continue with the rest of the DPK Install steps as described in the Oracle provided documentation. You should now have a fully functional VirtualBox demo image. Tip: if your usage is light (no SES, not running payroll, etc), then you can easily drop the allocated memory for your VirtualBox image down to 2 GB. I've even run them as low as 1 GB. Memory is important, but I derive the most performance improvement from running these images on an SSD. In this session I will share interesting, thought provoking PeopleTools tips and techniques to help customers make the most of their PeopleSoft development investment. Recording available here. 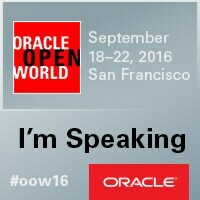 Attend to learn various options for mobilizing PeopleSoft Applications. Why choose between Cloud and Ground when you can get the best of both? In this demo-intensive session, we will illustrate the flexibility and safety of your PeopleSoft investment. You can register for our Webinars on the GreyHeller website.